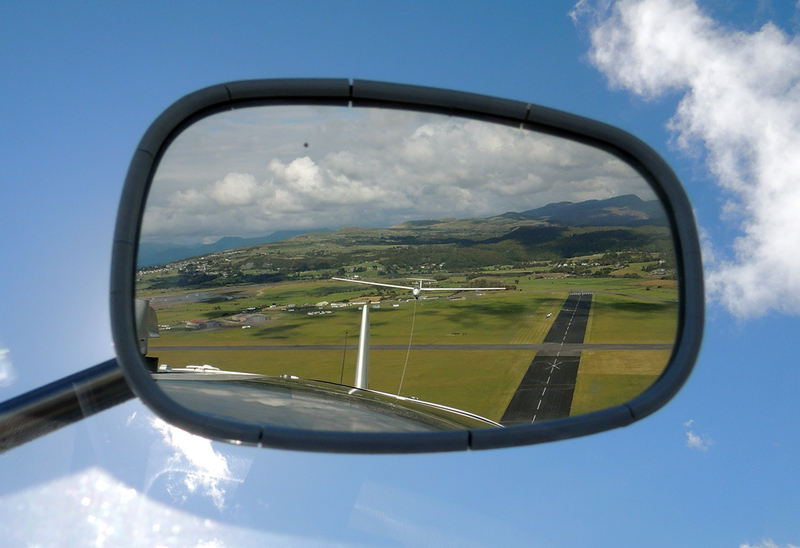 Towing out of Llanbedr through the tug’s rear view mirror. London Gliding Club spent a great 3 weeks at Llanbedr in North Wales. An area rarely seen or explored by glider pilots due to it’s rather inaccessible location. The rewards were fantastic scenery and an interesting mix of ridge, wave, thermal and convergence flying. The locals enjoyed watching our exploits and were very supportive. From a statistic point of view, the group achieved 254 movements of which 214 were aero-tows, the others being self launch or motor glider movements. A total of 436 hours flying was recorded. Each day was flyable though a couple were lost because of commercial activity on the airfield and one day, a decision made not to fly. There were 7 wave days of which 5 were well used by the expedition. A maximum of 12,000′ was achieved by a couple of gliders and Clem Allen gained his Gold Height on one of those. 13 did the most exploring with it’s flight across Anglesey and wave flight to Llandudno. There was some basic training and a few early solo flights done showing there was something in the trip for all. Over 70 members of LGC participated in some shape or form, 4 club gliders, LGC(Duo Discus), EPD(K21), EVW(K23) and HCV(Cadet’s ASW19) along with 26 privately owned gliders, or motor gliders all made an appearance. Thanks must go to Robin, Dan and Phil for making it all happen, and Trevor for his help in the last week. Also Ed from Fly-Llanbedr and Jason, Llanbedr Site manager for putting up with us and allowing us to use this amazing airfield. Thanks also to RAF Valley for co-ordinating their training around our gliding. As a gliding enthusiast who was on holiday in Harlech over the same 2 weeks as your expedition, just to say thanks for the daily blog. Watching all the fun from down below or indeed from the hills above helped make my holiday one to remember. And then reading about it the next day together with some great pictures and excellent video added even further to the enjoyment. I think that area of Wales has great potential and it would be fantastic to see the aviation movement at Llanbedr start to develop as its a fantastic airfield in a great location. Again, thanks for the blog.